An editorial comment published today in The Lancet on new research led by Prof Sheila M. Bird and Andrew McAuley. The level of an individual’s tolerance is crucial in determining the outcome of an overdose, and it has been found that overdose deaths are more likely to occur in specific situations—for example, the period shortly after prison release, hospital discharge, or completion of an episode of residential detoxification or recovery treatment. 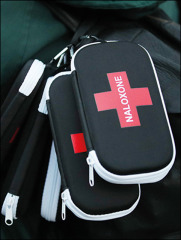 The distribution of take-home kits of the opiate antagonist, naloxone, has now been shown to be effective in reducing opioid-related deaths. In Scotland, which was the first nation globally to adopt a naloxone programme in 2011, opioid-related deaths in former prisoners within 4 weeks of release from incarceration have reduced by 50% since the introduction of the programme. Several other countries have their own versions of Scotland’s National Naloxone Programme reports a letter published in The Lancet today, including Canada, Norway, and the USA. A key element in the success of a take-home naloxone programme is the actual number of kits distributed—research indicates this should be about 20 times the number of a country’s opioid-related deaths. The kits should be given to the opioid user to distribute to friends, families, and other contacts such as health-care workers and all should be alerted to when the user is in a period of heightened risk. The opioid crisis requires multifaceted, multidisciplinary, holistic, and international interventions. However, as a temporary, and now proven, effective short-term solution to reduce opioid-related deaths due to overdose, a programme of take-home naloxone must now be widely adopted.